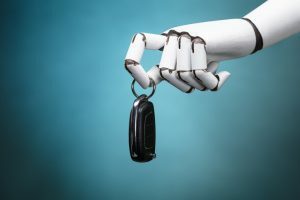 Home / Parking Matters Blog / Robotics: The Future of Parking, or Future Nightmare? Robotics: The Future of Parking, or Future Nightmare? A few years ago while working on a parking consulting contract in Glassboro, N.J., Dennis Burns, CAPP, and I made a side trip to visit Boomerang Systems, a new company billing itself as an industry leader in designing and operating robotic parking garages. The test facility was most impressive. Computer-controlled pallets moved cars from elevators to spaces on multiple floors swiftly and efficiently, maximizing space. The advantages of this new technology seemed overwhelming. A robotic garage, according to Boomerang, could park twice as many cars in the same amount of space as a conventional garage. Security was guaranteed, because only attendants could enter the garage. Cars could be parked within inches of each other without the danger of collisions or even door dings. Packages and valuables could be left in the car without danger of theft. The technology seemed perfect for residential towers where speed of retrieval was not as important as, let’s say, a stadium, arena, or office facility, where everyone wants to exit at the same time. Now, the company that demonstrated the system for us at their test facility has declared bankruptcy, and owners of residential units in Brickell House, where the parking garage was operated by Boomerang, are very angry. Boomerang Systems has had to turn over operations of its equipment to another company, so ordered by a bankruptcy judge in Miami. So is this a problem with the concept, a problem with the operator, or a combination? There are other examples of apparently successful robotic garages in the U.S., Europe, and Asia. Here is a video of a system in Hiroshima, Japan. My sense is that the technology is still evolving and the failure of one company should not deter other parking operators from exploring automated garages if the location and use are appropriate. The advantages of a robotic garage are too significant to ignore, and the technology will improve as time goes by. But for the present, let the buyer beware. David Feehan is president of Civitas Consulting, LLC.